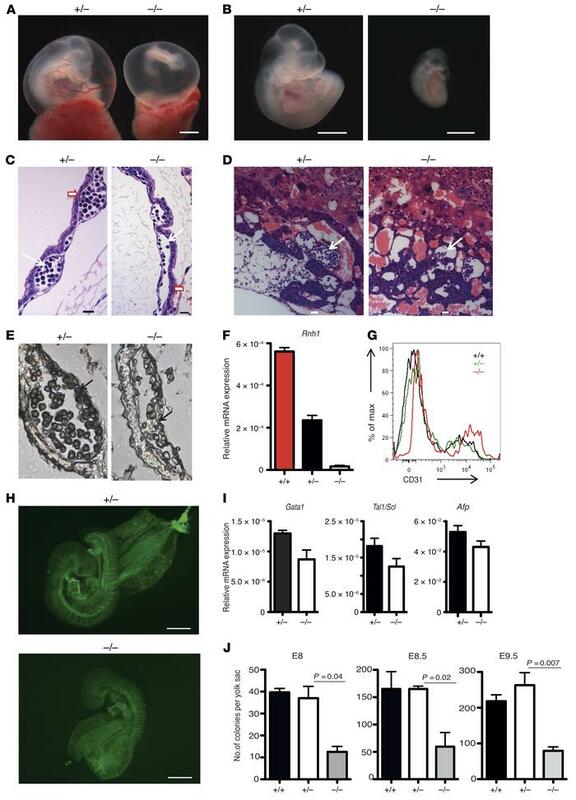 Decreased embryonic erythropoiesis in Rnh1-deficient mice. (A and B) Morphology of E10 Rnh1+/– and Rnh1–/– whole embryos (A) and embryos proper (B). Scale bars: 1 mm. (C) H&E-stained sections through visceral yolk sacs of Rnh1+/– and Rnh1–/–. Scale bars: 20 μm. Thin arrows indicate blood cells; thick arrows indicate endothelium layer. (D) Parasagittal section of placenta of Rnh1+/– and Rnh1–/–. Scale bars: 20 μm. Arrows indicate blood cells. (E) Benzidine-stained sections through visceral yolk sac of Rnh1+/– and Rnh1–/–. Arrow indicates blood cells. (F) qRT-PCR analysis of E9.5 yolk sac for Rnh1, normalized to 18S rRNA expression (n = 3–5). Data are shown as mean ± SEM. (G) CD31 mean fluorescence intensity analyzed by flow cytometry (n = 3) on E9.5 total yolk sac cells. (H) Pecam-1 (CD31) immunostaining of E9.5 Rnh1+/– and Rnh1–/– embryos. Scale bars: 500 μm. (I) qRT-PCR analysis on E9.5 yolk sac for the indicated mRNAs, normalized to 18S rRNA expression (n = 3–5). Data are shown as mean ± SEM. (J) Total number of colonies observed when E8–E9.5 yolk sac cells were cultured for 7 days in methyl cellulose medium (n = 3–4). Data are shown as mean ± SEM. P values were determined by 2-tailed t test.